Many years experience in the competitive Dressage world . Senior Basic Dressage Judge with the Canadian Equestrian Federation. FINALLY! Discovered Natural Horsemanhip in 1995 after an active search for REAL communication with a horse. Burned her judge's card and hung up her spurs and double bridle to become a true student of the horse. Larry Stewart, Pat Parelli, Karen Rohlf and Charles de Kunffy as mentors. 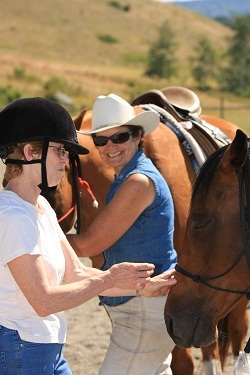 Since the beginning of Jandana Ranch in 1993, Janice has retrained over 50 unwanted and troubled horses which are now being used in our natural horsemanship programs. 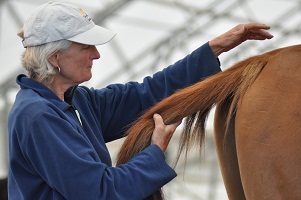 Lenox has been a student of Natural Horsemanship for many years following a base of years of horsmanship experience. She has been a fabulous mentor of troubled youth girls by being a foster parent for 20 years. She currently mentors foster parents. An avid learner, a true student of the horse. Lenox rocks! Dave is the guy who runs the machinery around the ranch, and yet can sit on the fence and can totally absorb information about horsemanship as he watches lessons while the rest of us study away, read, watch dvd's, take clinics etc, etc. He and the oppositional husbands of horsey wives really connect and pretty soon he has them up and riding and asking questions and going out in the bush to ride the trails etc, etc! He is also the guy who the little riders see and ask: "Can I have the cowboy teach me?" 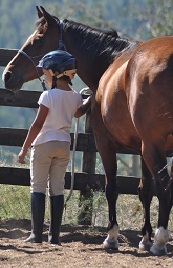 We have many talented young students of the Jandana Ranch Horsemanship program. These people have developed superb horse and people skills. They are the backbone of the ranch and volunteer their time helping us with lessons and with the management of the animals and the barn. These young people are the future of the growth of compassionate horsemanship based on understanding and leadership. We call our volunteer program, "Future Employees of Jandana Ranch".